What’s great about OSU football is that they are traditionally so awful, you never have to worry about getting a ticket ahead of time. You just drive the 45 minute scenic river highway to Corvallis, park across the street and select any number of general admission seats at the 50 yard line. With all this in mind, I suggest we leave two hours ahead of gametime instead of our usual hour. I want to get one of those prime parking spots. What, that lot’s now by permit only? We’re directed several blocks to the paid lots. $10. Jim scowls. Further down we nab a spot on a residential street. Alas, Jim has worn uncomfortable shoes and I worry if our extra hour will be sufficient to stagger to RESER foods, I mean, RESER stadium. Two general admission seats, please! We head toward those primo seats in the bright sun. What, general admission is now in the END ZONE? I try upgrade, but am told all reserved seats are sold out!!?? Unbelievable. Jim leads me up high in the end zone, the most sorrowful place I’d ever been. Before long I realize we’ll have no difficulty hearing the announcer, as the speakers blare into our backs. Jim, let’s go lower. "No, the view’s better up above." And who are these rabid people sitting between us and the speakers? They begin chanting, "Georgia!…Southern!…Georgia!…Southern!" Oh, my gosh, we’re in the middle of the confederacy. And finally, the most painful taunt of all:"Thirty year LOSERS!" Now, I’m not a particularly sensitive Beaver fan, but ouch! These are true, shrieking maniacal fans. Most of them are somebody’s daddy on the field. They holler in support:"Go, boy!" and "Defense, defense," which comes out more like a four syllable word, "Dee-ah-feh-ance!" Oh, I love the Georgia accent. I’m thinking, hey, I should try to bond with these people, seeing how I was born in Georgia, and all. I turn, and behind me is the most scariest, raging, immense Eagle fan of all, one not shy with comments about rodents. Jim grabs me in fear. "Don’t turn around and taunt them!" I’m not sure what he thought I was going to do, but his warning has a subduing effect on me. I keep my eyes pointed straight toward the opposing endzone. Half-time. It’s a double alumnae day for me with Sprague’s marching band on the field. Of course, we clearly hear the announcer’s description of Sprague’s band, how they are performing some dark, controversial Russian death piece. The band drones away and Jim spots a lone black leotard spastically running around the tuba and trumpet players. "Oh, my gosh!" Jim cries, "A crazed woman has run onto the field!" I stare in horror, until I spot other black figures spasming around the clarinet and flute players. 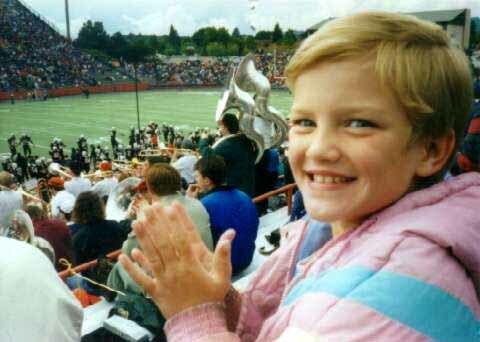 The lead leotard convulses onto the artificial green of RESER field. Next, the surviving leotards hoist her rigor-mortised body above their heads and carry her off RESER field. I sigh and wish they’d play, "Louis, Louis." I glance over at Jim; he is dozing off in the hot sun. My chance has arrived. I turn and come face to face with the biggest, baddest Georgia Southern fan of all. He calls me, "Ma’am." He tells me how they are all staying in Eugene, and how delighted they were to pull into RESER stadium and see actual normal people here. I tell him we have a saying, "Old hippies never die, they just move to Eugene." He laughs heartily and says he’ll tell the other Eagles that one at dinner. We chat and laugh some more. Finally, Sprague’s band leaves the field, Jim wakes up, and we all turn our attention back to the game, OSU-24, Georgia Southern-21. The rabid fan behind me has gone soft, silenced by love. Jim is dumbfounded. The Beavers and Eagles trade touchdowns; both offenses roar. OSU’s defense? Well, maybe Sprague should have dispatched their defensive unit instead of their wearisome, award-winning band. By game’s end, we’re sunburned, OSU’s up 48-41, and Jim, too, has bonded with our Georgia Southern neighbors. 1. There are certain prices to be had with success. 2. The best way to deal with your enemy is to make them your friend. 3. Pump up your schedule with as many Division I-AA teams as possible.